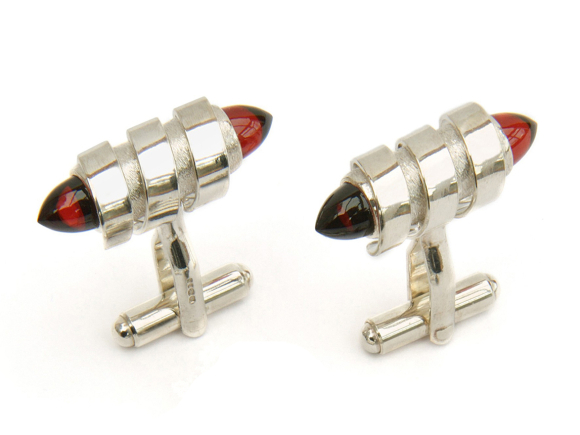 Sterling Silver, bullet shaped red Garnet gemstones. Size: 2.8 x 2.8 x 1cm. These distinctive and precious cufflinks incorporate gems of an unusual 'bullet' cut. The design develops further the previous cufflink design but is slightly bigger and bolder. It also combines textured (matt) and polished silver finishes adding to the striking impression. The polished silver coil, which is a separate moveable part, is secured into position onto the textured silver bar inside creating a playful effect.